Spirits sure love their sweets! A dash of sugar and a pinch of spice has turned this Haunted Shipwreck into something nice! Thinking this ship is their ticket to a sweet trip to the candy shop, mice will be more than happy to climb on the Ghostship Lollipop! The Limited Edition Ghostship Lollipop Trap Skin can be used on the Limited Edition Haunted Shipwreck Trap trap. The trap's stats (power, power bonus, attraction bonus, etc.) are not changed. 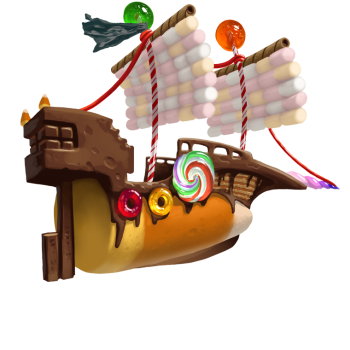 The Ghostship Lollipop Trap Skin was obtained during the Creepy Carl's Cursed Cruise event. 17 October 2017: The Ghostship Lollipop Trap Skin was introduced with the start of Creepy Carl's Cursed Cruise. This page was last edited on 16 February 2019, at 14:48.